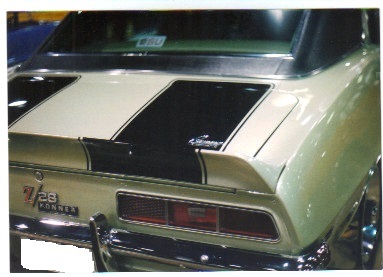 1969 Z/28 & Pace Car Camaro stencil kit includes paint mask for dual stripes on header, hood, cowl, rear deck & spoiler. 1969 Z/28 & Pace Car Camaro paint stencil kit first released by us in 1983 working with an original GM stencil kit. Left & Right front header/hood stencils. Left & Right cowl panel stencils. Left & Right rear deck panel stencils. Kit includes a 40′ prespaced paint mask roll to join stencil the front hood to cowl panel stencils and to complete the Left & Right dual stripes from the rear deck to end of spoiler. Color photos showing original car & over spray. Kit is designed to fit coupe, convertible and Pace Car models. 1051250 1968-72 Brushed Aluminum plate used on inside of door with blue background. Great addition to any car.